LARPBO is a 501C3 non-profit that offers post dog adoption services such as education, support, low cost training, and dog activities providing socialization. While LARPBO advocates for bully breeds, it believes that every dog owner – whether having a tiny Chihuahua or giant pit bull – has a responsibility to do their best to make sure their dog is a pleasant, enjoyable, well-behaved member of their community. LARPBO services are open to all breeds. Proceeds from this benefit show will fund LARPBO's Shelter Intervention and Prevention Program ("SIPP"). The SIPP program was established to (1) help intervene where it is deemed dog training would keep the owner from surrendering a pup and (2) prevent dogs from being returned to the shelter. The program is funded by supporters who want to help in LARPBO's endeavor of keeping dogs home and out of shelters. LARPBO distributes the vouchers to individuals who meet the program’s purpose and/or to shelters driving distance to group class locations in Sherman Oaks and Long Beach. In 2010 Tino started PeaceLoveandPitbulls.org a 501 c3 rescue, training, advocacy and Kissing Booth for pit bulls in Las Vegas. 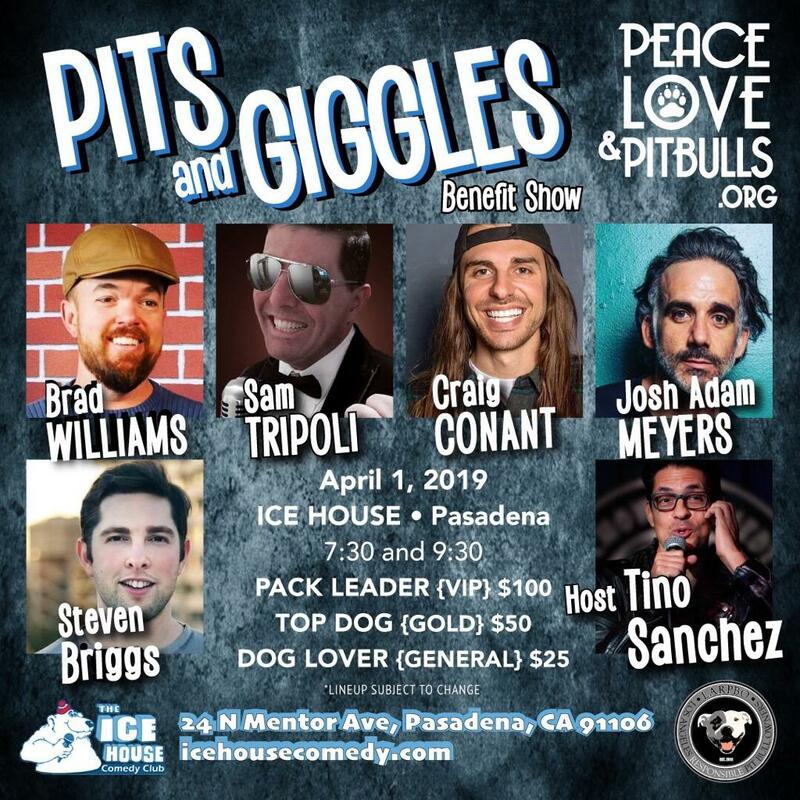 PeaceLove&pitbulls went viral with their 5 pit bull kissing booth and the “Bandit” video which caught the eye of LARPBO’s founder Troy Smith who offered Tino the position of head trainer for LARPBO. So Tino loaded up the pack and moved to LA. Tino grew up with dogs, got his 1st pit bull at age 17 and never looked back. after yrs of trial and very much error Tino decided to do it right and get some formal training. Tino has been professionally training dogs of all breeds for 15 yrs. And doing stand up at night for 5 yrs. Josh was born in Baltimore, Md. Since moving to LA in 2008, he has been featured on Comedy Centrals "Workaholics" and Spike TV. In 2013 he was selected as a "New Face" at the Just For Laugh's Montreal Comedy Festival. He is also the host of The Goddamn Comedy Jam. A monthly show at the Lyric Theater.